To understand the interactions between real and financial aspects of an economy, this paper investigates cyclical relationship between credit and growth cycles in India and US over the period 1994-2013 in the frequency domain. Originality of our contribution is in the use of Multitaper method of spectrum estimation which has the advantage of giving reliable estimates even in relatively short samples and provides jackknife confidence intervals of spectral statistics. Contrary to most studies which find credit cycles to be longer than business cycles, univariate spectrum to infer duration of series shows that credit and output cycles are similar in duration of approximately three years. We find that there is a strong coherence between credit and growth cycles in both India and US but the synchronization is relatively much stronger in US. 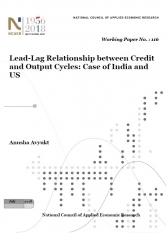 Lead lag relationship suggest that credit is a reliable leading indicator in US for a broad frequency range but in India, industrial production leads non-food credit and coherence is high only in the long run. This difference can be explained by difference in financial deepening and sophistication of financial sector in the two economies and has implications for macroprudential policies and for using credit based early warning indicators.